he first (somehow it seems always to be the first) GW Warmaster Staff Tournament was held in the GW headquarters in Nottingham. Mr. Priestley was so kind to sent me an invitation even so I'm not an GW employee. So I had the opportunity to play as a guest as had David Simpson and Christian Burnett. I found the tournament quite relaxing and great fun. The rules resembled the rules used at last years campaign day. 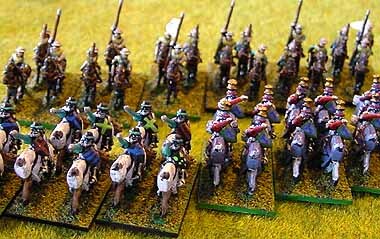 The players would be grouped into empires (18 players forming 4 empires) and each empire would select an empire to attack. By the order of attacks the referee (Mr. Priestley in this case) would determine which empires fight and than randomly the players fighting each other would be selected. If there were an equal number of players the battles would be one on one, 2000 points each. 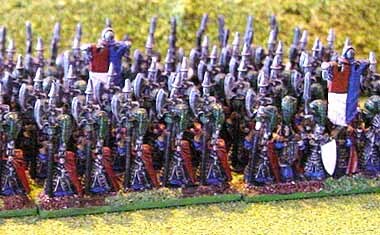 In case of unequal number of players one of the battles would be 2 players with a 1000 points each against one player with his complete 2k army. An empire would win an territory from an other empire if it wins more battles. The winning empire would be the empire owning most territories at the end of the day an the winning player would be the one scoring most victory points using the standard victory points system from the rule book. 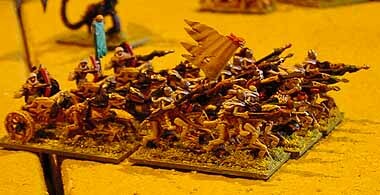 Out of 18 armies here were 5 Undead, 4 Chaos, 3 Empire, 3 High Elves, one Dwarf, one Bretonian and one Orc and Goblin army. 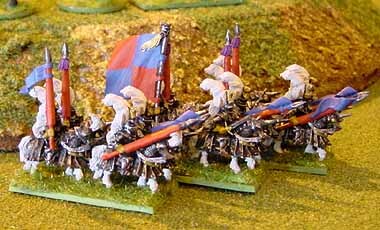 The Undead players formed the first , Dwarf and Empire troops the second, High Elves and Bretonians the third and Chaos and Orcs the fourth empire. My army choice was rather typical (for me that is) and was not specially tuned for the tournament. I willingly choose a lower number of heroes and shamans than favoured by other players, and use the points to buy better and/or more troops. 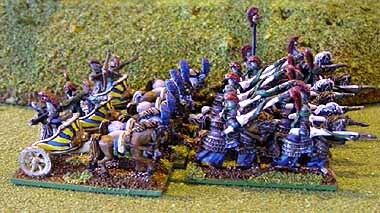 And it proved quite valuable as the trolls I bought for the saved points together with Ogres and ordinary infantry not only held but won the right flank more than once against chariot and cavalry. The Chaos Empire won the best Empire award, and the staff tournament was won by Brian. 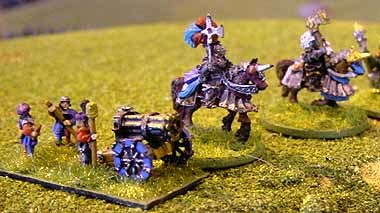 Additional information and pictures can be found at warmaster.co.uk.